Return to the great mansions of the Western District with this book of remarkable histories and stunning photography. English novelist Anthony Trollope described the Western District squatters in the 1870s as ‘plentiful, proud, prejudiced, given to hospitality, impatient of contradiction … thoughtful on the future, and above all, conscious—perhaps a little too conscious—of their own importance … forty thousand sheep cannot be shorn without a piano; twenty thousand is the lowest number that renders napkins at dinner imperative’. But these squatters were also speculators and investors, whose entrepreneuship built great wealth and elaborate mansions. Around their Georgian and Victorian homes they created an antipodean England, employing the best-known landscape architects of the day. The Western District today retains most of the renowned homesteads and gardens that date from these times. 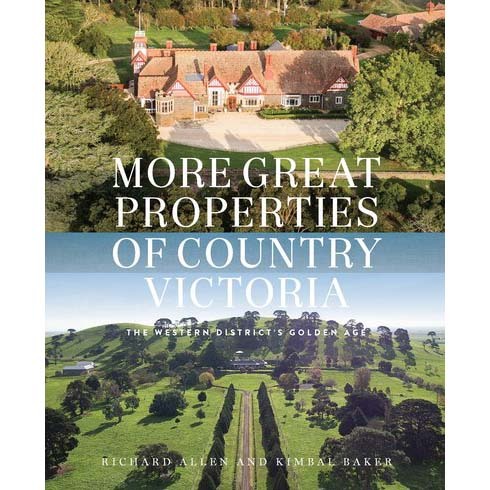 This fascinating and beautiful book—sequel to the bestselling Great Properties of Country Victoria—takes us into the private world of thirteen more notable properties. Through their histories we follow their fortunes—extraordinary tales of risk and reward—and through the photographs see the splendour of great homes that have been lovingly maintained and carefully restored. It is a tribute to the past and present owners who have so painstakingly preserved their properties’ heritage.